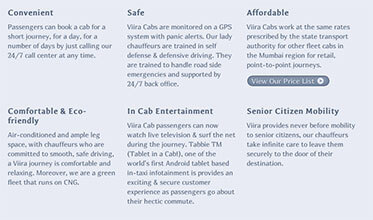 Viira Cabs is a taxi service for women in Mumbai. They provide employment opportunities to women from low economic backgrounds by training them at their Motor Training School. We set out to help build a small website to help promote their services. 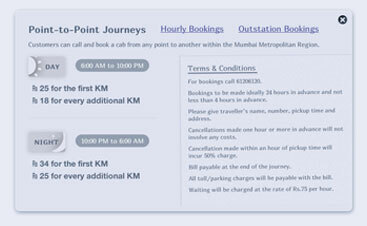 After much conversation with the promoters who run the cab service their message and needs for the website became clear. 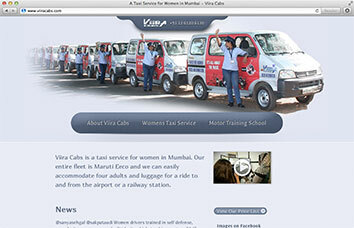 We focused on three main areas - The Taxi Service, The Training School and A Profile page to show their goals and beliefs. We really tried to keep things simple with the design. The design of the site represents the view from inside a car. The website was designed for viewing on various screen sizes including the web capable mobile phones. 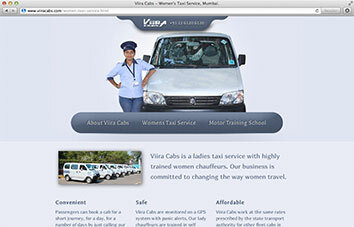 Women can contact them immediately from their mobile with a search for "women taxi service" on google. We made the footer visible with even the slightest of downward scroll. The other links would be visible at all times.